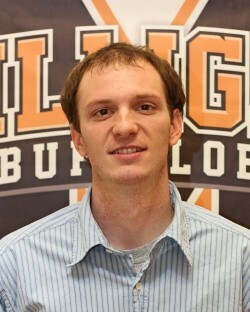 MILLIGAN COLLEGE, Tenn. (Dec. 17, 2013) – Daniel Manget has been named sports information director (SID) at Milligan College, announced Chandrea Shell, director of public relations and marketing at Milligan. Manget, a native of Marietta, Ga., previously served as SID for former Appalachian Athletic Conference foe Covenant College, where he guided the sports information operations for 13 varsity sports during the school’s transition from NAIA to NCAA Division III. He recently completed a master’s degree in sports administration from Marshall University, where he served as a graduate assistant in the “Thundering Herd’s” SID office and was the primary media representative for baseball, women’s soccer, tennis, and track and field. Manget holds a bachelor’s degree in mathematics and a minor in physical education from Covenant, where he competed for the “Scots” in tennis. Posted by tommy on December 17, 2013.